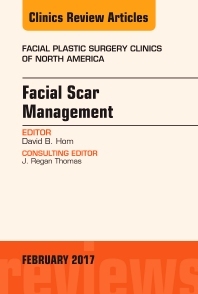 This issue of Facial Plastic Surgery Clinics, guest edited by Dr. David Hom of the University of Cincinnati, is devoted to Facial Scar Management. Articles in this outstanding issue will focus on scar treatment of the forehead, periorbital region, cheek, nose, perioral and chin region, auricle region, scalp, neck, and oral mucosa. The issue will also address soft tissue management to minimize scarring, new scar treatments using lasers, and skin color and pigmentation in ethnic skin.